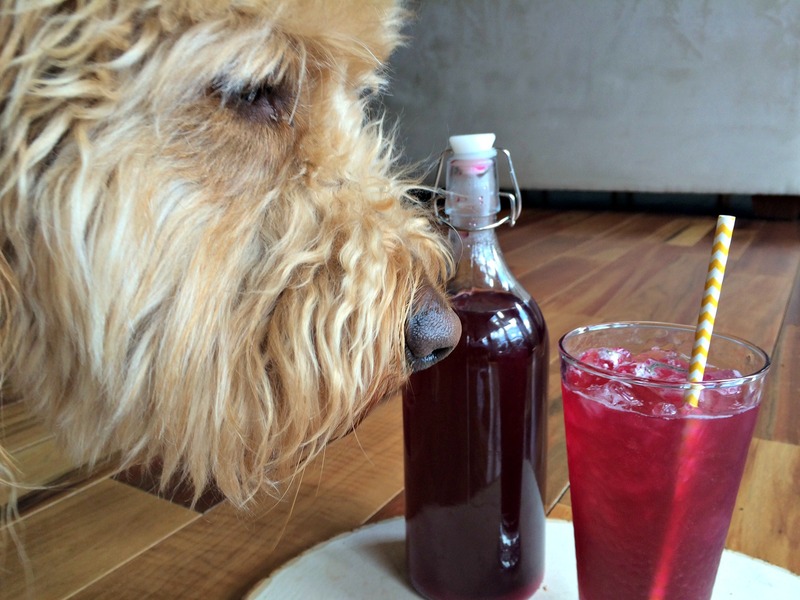 Even my dog, Roxie, is interested in improving her gut health with fermented soda. 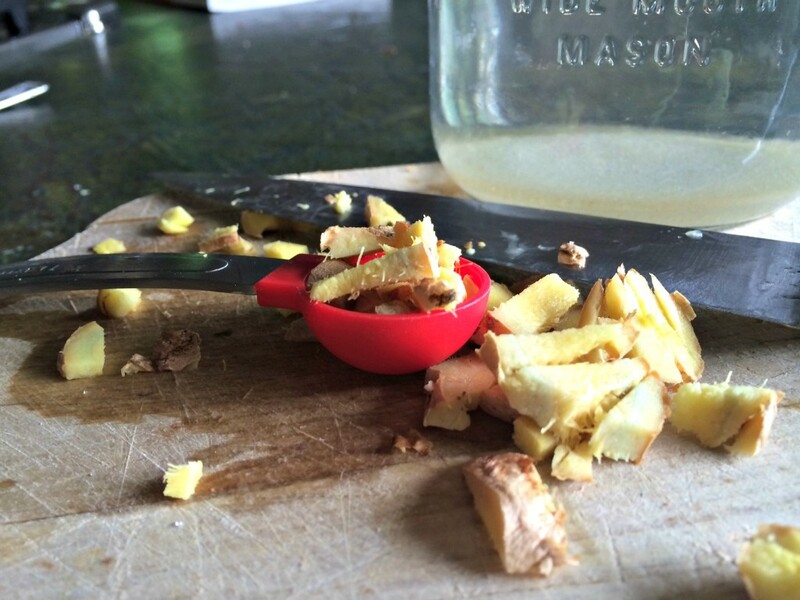 Chopped ginger to start the ginger bug. In a quart sized jar, mix all three of the ingredients. Cover jar and give it a shake to mix the ingredients. If your house gets cold at night, you might want to use a seedling mat or heating pad to warm your bug. Everyday for a week, add 2 more teaspoons of ginger and 2 teaspoons of sugar. Towards the end of the week, you will see your liquid begin to get bubbly. Once good and fizzy it is ready to be combined with the blueberries. Above is a picture of the ginger bug on the seventh day. You can see the bubbles near the top of the jar. You can also see the blueberries in the background. I used organic frozen blueberries but fresh works just as well. 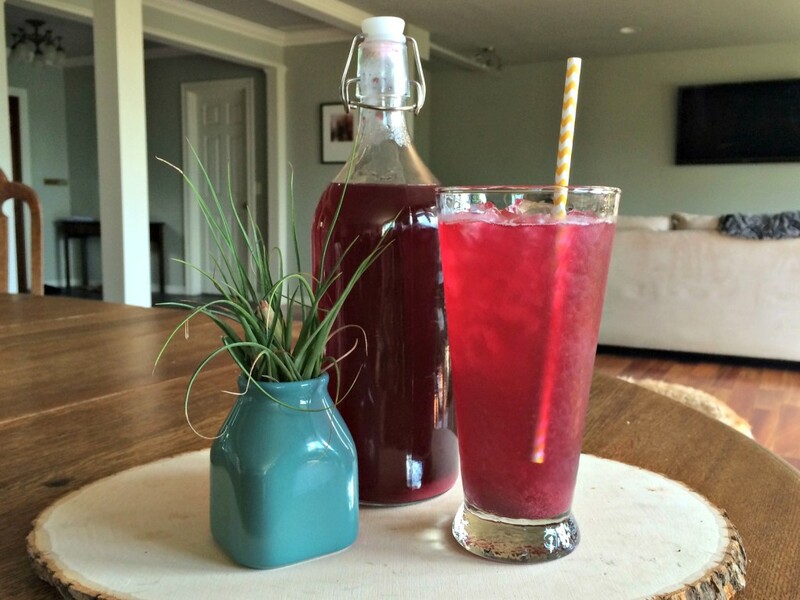 Once the bug was done, I used a recipe from Learning Herbs to make my blueberry soda. Put 1/2 gallon of filtered water in a large pot. Add your blueberries to the pot and allow the water to come back to a boil. Taste to see if tastes fruity. If you want a fruitier taste, let it boil longer. Strain ginger bug to remove particles of ginger. Cover with cheese cloth held down with rubber band or you can use paper coffee filters. Place jar in warm spot but not in direct sunlight. Allow to sit for at least 3 days. Stir each day 2-3 times. You want to strain your liquid to remove all the berry solids. Allow to sit out for another day to increase the fizziness of the soda. When it is a bubbly as you want, move it to the fridge to stop the fermentation process. Blueberry soda fermenting on the counter. I am happy to say that even my kids like this blueberry soda. In fact, they kept hunting for more even after it had all been consumed! I was happy because my mission to get them to consume more ferments was accomplished. 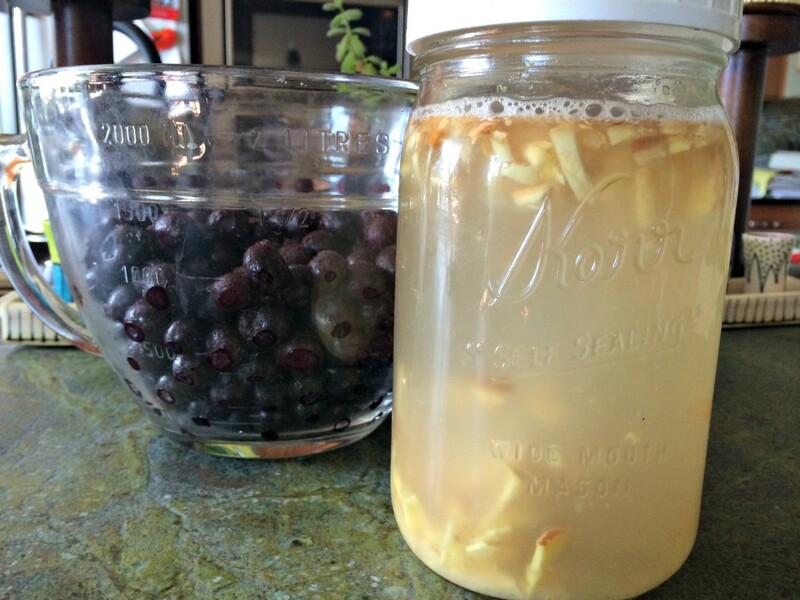 (Read more about the importance of fermented foods here.) The soda was fruity and fizzy but not too sweet. It tasted very refreshing on the hot summer days. Finished soda ready to drink. This post was shared on Plant Based Pot Luck, Homespun Oasis, Allergy Free Alaska, Urban Naturale, Real Food Forager and Live, Laugh, Rowe. What a delightful and refreshing natural beverage. 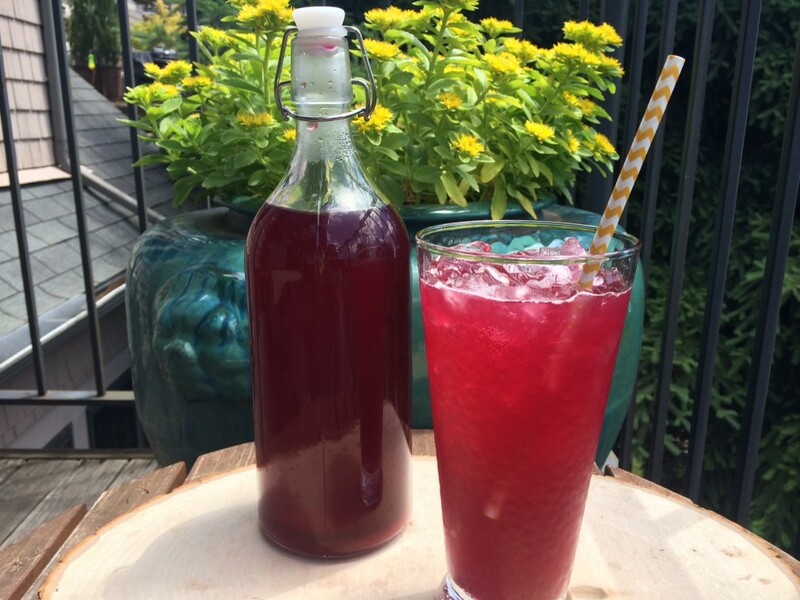 It’s perfect for the summer too and a nice alternative to soda.I’m a ginger lover so I am delighted that you shared this recipe for Fermented Blueberry Ginger Soda with us at the Healthy, Happy, Green and Natural Party Blog Hop! We ‘ll enjoy it! Looks delicious! Thanks for sharing at Simple Lives Thursday. These photos are so mouthwatering. 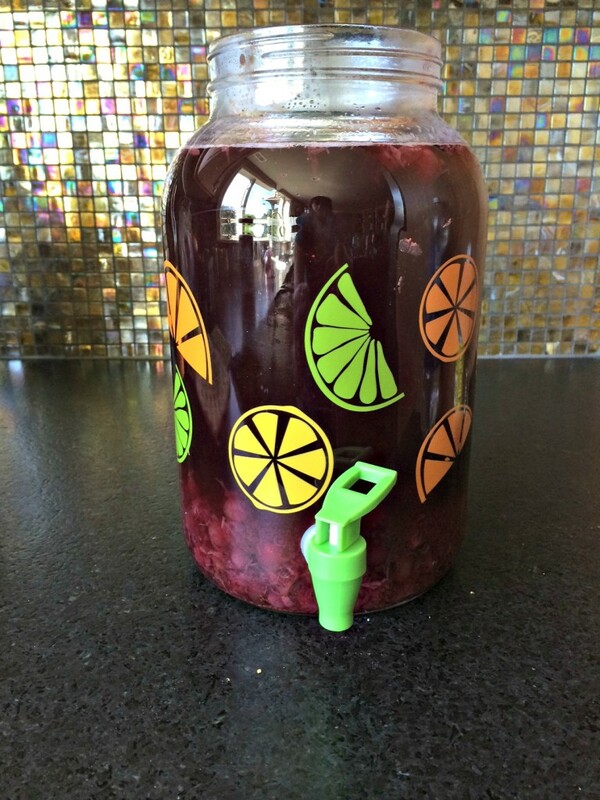 I can’t wait to make this fermented blueberry soda! What do you do with the rest of the ginger bug? Does it go in the fridge too you do you keep letting it ferment? I usually either make extra soda or I drink the ginger bug! Everyone in our family likes the soda so it goes VERY fast around here. It is super tasty!